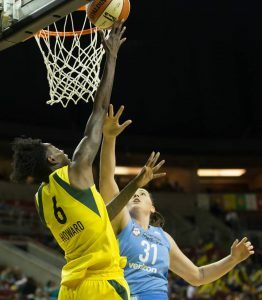 Natasha Howard scores the reverse layup on Stefanie Dolson. Neil Enns/Storm Photos. 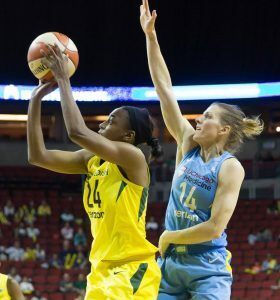 Seattle – Her stat line may not jump off the page next to 29 points from Jewell Loyd and 28 from Breanna Stewart. 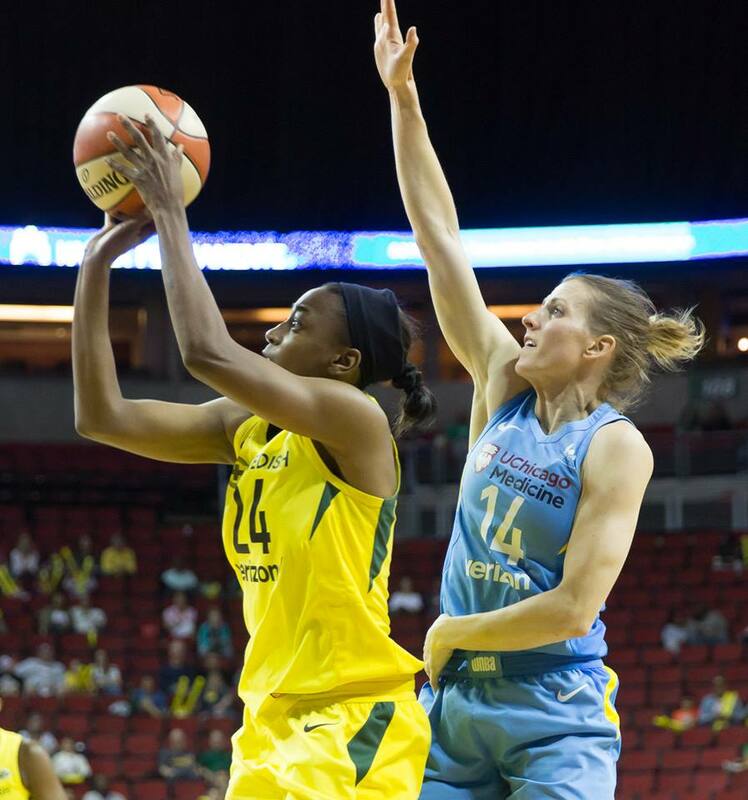 But in Friday’s come-from-behind win over the Chicago Sky, the game’s defining moments belonged to Natasha Howard. In the span of four seconds, the fifth-year forward capped the Seattle Storm’s 14-point comeback with a put back off a Stewart miss, and then she followed it with a block on the other end to maintain an 87-87 tie. “She saved the day for us,” Stewart said. Seattle then outscored Chicago 8-to-4 in the extra period for a 95-91 victory at the Key. Jewell Loyd gets by Allie Quigley’s defense. Neil Enns/Storm Photos. Loyd’s 29 led all scorers, while Allie Quigley had a team-high 23 for the Sky on 8-of-12 shooting. 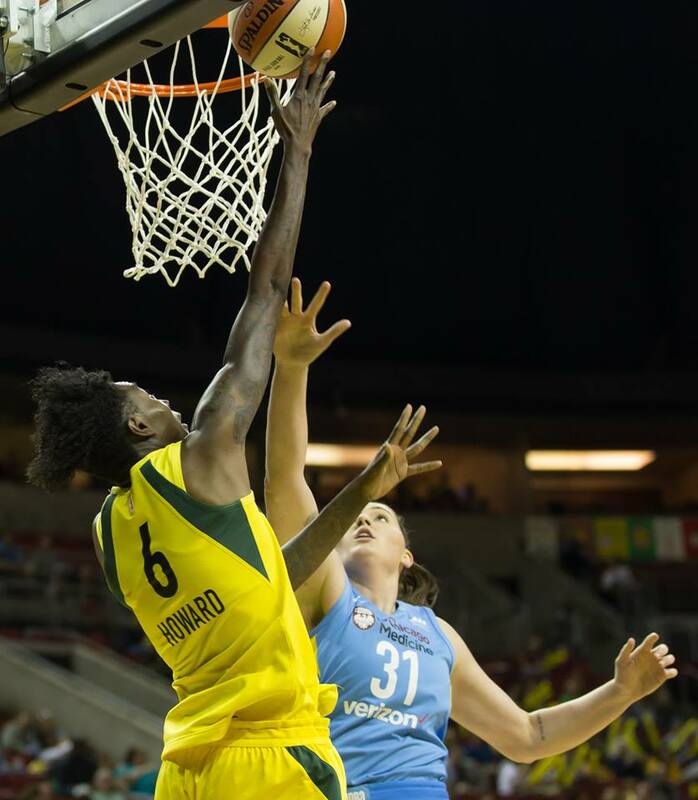 Howard notched her first double-double in a Storm uniform with 16 points and 10 rebounds, along with four blocks – all in the four quarter and overtime. Chicago (2-2) led by as many as 10 in the first half, before a late Storm run in the waning moments of the second quarter cut the advantage to three at the break. Seattle used a 7-0 run to start the third to take a short-lived lead of its own, but trailed by 11 heading to the final period. A lay-up from Kahleah Copper with just under six minutes to play extended the Sky lead to 14, at 80-68, before the Storm began to chip away. But more importantly, according to head coach Dan Hughes, the team turned up its defensive activity to “another level,” holding Chicago to just seven points to the end of regulation. 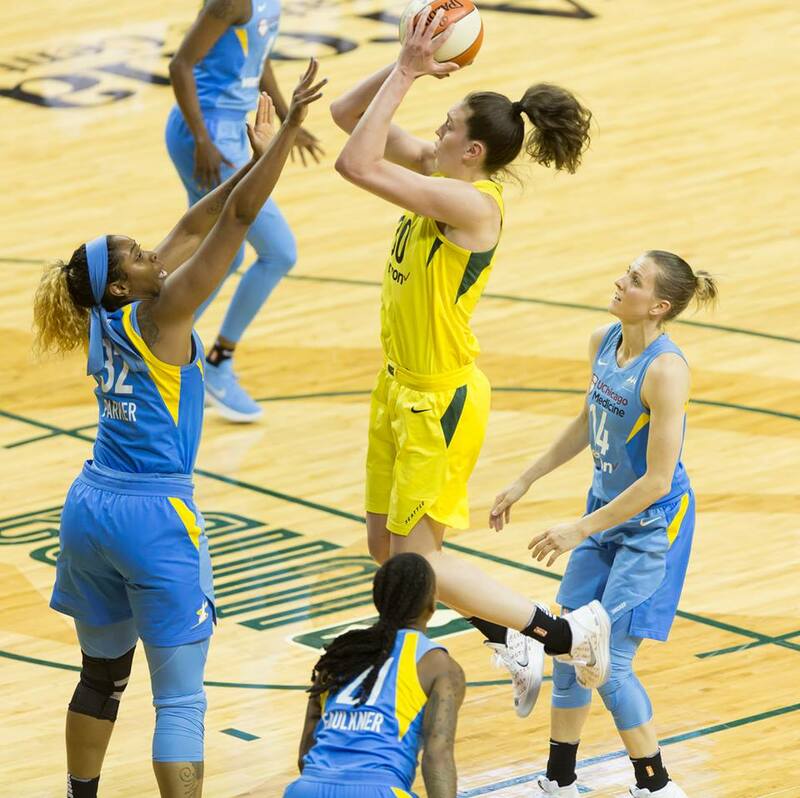 With the gap down to five with 35 seconds to play, Loyd hit threes on back-to-back possessions — bookending a pair of Diamond DeShields free throws — to cut the deficit to one. After Quigley split a pair of free throws, Howard’s put-back tied the score, and her ensuing block kept it that way. 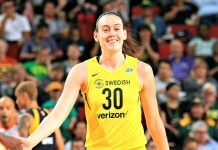 Breanna Stewart elevates over defenders to score. Neil Enns/Storm Photos. A hook shot to start overtime from Stewart gave Seattle its first lead since the early moments of the third, and the Storm would not trail the rest of the way. The coach also took solace in knowing his team could pull out a win on a night when the shots weren’t falling (just 42 percent from the field). Not that it came easy. “I’d love it to be smooth, but a lot of times understanding how to defend when our offense isn’t coming, those things don’t happen overnight,” he said. Seattle now travels to Las Vegas for that franchise’s home opener on Sunday at the Mandalay Bay Events Center, while the Sky return home to face the Sun next Friday night. Sue Bird moved to fourth on the all-time games played list, passing former teammate Swin Cash with her 480th appearance. SPOTTED: Tacoma native, UW grad, and Lakers guard Isaiah Thomas was on hand. Noelle Quinn missed her third straight game for Seattle with a right knee injury, but participated in warm ups with the team.